The habitual clenching and/or grinding of teeth is known as bruxism. It is a condition that can result in tissue deterioration and pain if left unaddressed. Unfortunately, this is a common result since not everyone with the condition realizes they have it. Bruxism has some overlap with temporomandiubular joint (TMJ) disorder, which is a syndrome of sorts that affects the joint between the mandible (jaw) and the skull. The result of the two is often similar in that they can both cause teeth grinding, but the causes and available treatments are actually quite different. Grinding and/or clenching of teeth. This can be audible to someone nearby. Flattened, fractured, or chipped teeth. Jaw, face, or ear pain. Worn enamel that potentially exposes inner layers of your teeth. Increased sensitivity in the teeth. Inflammation of the ligament that connects teeth to the jaw. Bruxism is also divided into two types: awake bruxism and sleep bruxism, referring to the time when the grinding/clenching activity occurs. The two types have similar symptoms, but not the same causes. The main identifiable difference (besides time of day) is that the pain from sleep bruxism peaks upon waking up and gets better over the day, while the opposite occurs in awake bruxism. The overlap in secondary symptoms means that it is possible to mistake one condition for the other. This is especially true since some of the TMJ symptoms can result in clenching activity similar to bruxism. It is also possible for the two conditions to exist simultaneously, which is not as unlikely as you might think. TMJ alone affects around 10 million Americans each year and bruxism has a similar prevalence. There is no clear cause of either form of bruxism, but it is generally recognized that the awake and asleep forms do not share all of the same origins. Awake bruxism is thought to be at least partially habitual in that some people with the condition do so as an unconscious focusing or coping strategy. Some children have been observed to clench or grind their teeth in response to earaches as well. Additionally, stress, anger, or anxiety may play a role. The emotional factor is shared between awake and sleep bruxism, but the nocturnal form is thought to be more the result of unconscious issues. Sleep apnea and other sleep disorders are known to result in bruxism, as is an abnormal alignment of the upper and lower teeth. It is also worth noting that some medications are known to cause either form of bruxism as a side effect in some patients. TMJ disorders are a bit easier to pin down in terms of causes. If the joint is eroded or moved out of alignment—from age, nutrient deficiency or damaged by injury—it is possible for a disorder to occur. Arthritis or other inflammations of the cartilage can also be the culprit. Lastly, people can be born with structural issues in their jaws that result in TMJ disorders as they grow older. Bruxism and TMJ disorders share a few overlapping causes, but these haven’t been determined as conclusively as would be preferred. Poor diet, inconsistent sleep habits, poor sleep posture, or orthodontic braces are thought to contribute to causing either condition. Mouth guards: A soft or hard material that is molded to fit between your teeth. Mouth guards are most commonly used in cases of sleep bruxism and will cushion the teeth to prevent damage. With certain TMJ disorders, a mouth guard can help but no one really knows why. Eat soft foods when possible. Avoid gum or chewy meals. Do not chew pencils or other non-food items. Position your tongue between your teeth to train your jaw muscle to relax. Soothe the muscle: A warm compress applied to the cheek in front of the earlobe can help relax the jaw muscle and relieve TMJ disorder symptoms or bruxism symptoms. Certain jaw stretches can also help build resilience. Relax: As mentioned, both medical and physical stresses can exacerbate bruxism and even TMJ disorders. Find ways to reduce the stressors in your life or consider calming techniques like meditation or naps. Medication: If necessary, you can talk to your doctor about medication options for treating your bruxism or TMJ disorder. The most commonly employed medicines are muscle relaxants, pain relievers, or corticosteroids. Surgery: Dental correction may be necessary to change how your teeth are aligned if there is a structural issue, although this form of oral surgery is not applicable to every case. In cases of TMJ disorders, more invasive surgery may be used to repair the joint and/or clear out any debris that is agitating it. This form of surgery is best considered as a last resort. 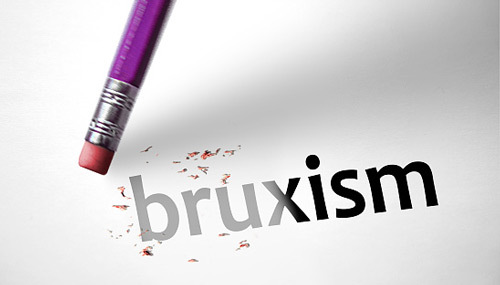 “Bruxism (Teeth Grinding),” Mayo Clinic web site, July 22, 2014; http://www.mayoclinic.org/diseases-conditions/bruxism/basics/definition/con-20029395. “TMJ (Temporomandibular Joint) Disorders,” Healthline web site, May 26, 2015; http://www.healthline.com/health/tmj-disorders#Overview1. “TMJ Disorders,” Mayo Clinic web site, December 13, 2012; http://www.mayoclinic.org/diseases-conditions/tmj/basics/definition/con-20043566. “Teeth Grinding (Bruxism): Causes and Treatments,” WebMD web site, http://www.webmd.com/oral-health/guide/teeth-grinding-bruxism#4, last accessed November 9, 2015.